I managed to finish Grey Seer model from End Times today. I must say, I enjoyed the process so much. It was nice change after bunch of Skaven Slaves, Clanrats or Stormvermin. Painting lords, heroes and special characters is so much fun. 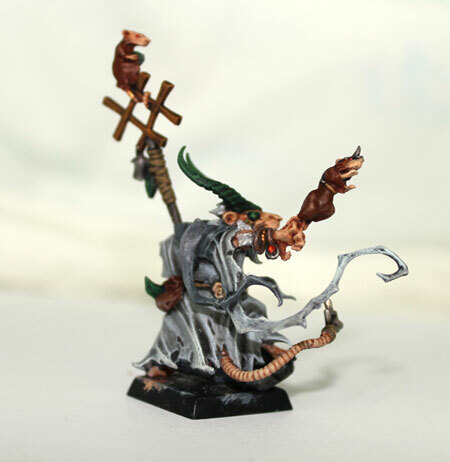 Too bad, my entire army can’t include only super awesome characters, with nicely scrupled miniatures like this Grey Seer. I bought this mini in Mexico City. It is my first model from latest Games Workshop End Times releases. I remember when I was leaving Europe, Nagash book have been already published, and Glotkin book just appeared in shops. All those awesome miniatures, like Nagash, Arkhan or Glotkin Brothers were tempted me: buy me, buy me! It doesn’t matter, I’m expensive and you don’t even collect Undead or Daemons – BUY me! I was so close to buying Glotkin. The miniature is a masterpiece. Absolutely ‘must have’ for every Chaos player. And because of that miniature – I seriously started to think about re-buying Chaos Army. In late 1990s and early 2000s I owned few thousand points of Deamons (mostly Khorne and Tzeenth) and Beastmen. Right now they are all gone, but the sentiment lives on. Actually, when I decided to get back to wargaming hobby and I was thinking which Warhammer Fantasy Battle army to choose – Chaos was my second choice, right after Skavens. I resisted the temptation of Nurgle, only because next End Times part was about to be Skaven’s. So I decide to wait for it. The slight problem was – Skaven Book was announced for January – and in this month, according to my travel plan, I should be in Costa Rica. And by looking the size of Nagash, Glotkin or any other End Times releases – I was prepared for some nice, massive Skaven minis. 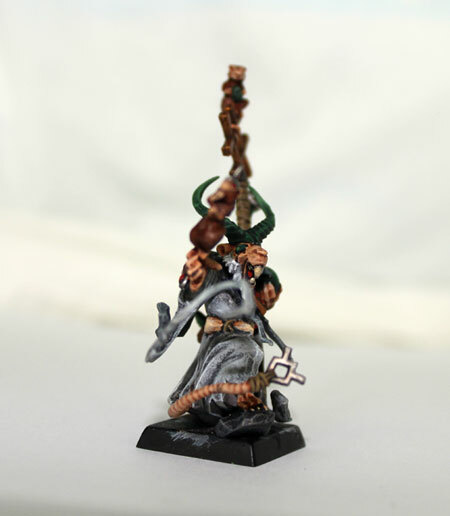 And of course, I was right – Vermin Lords, Thanquol on Boneripper, Storm Fiends. Super awesome – but not so mini any more. Usually I don’t mind the size like that, and in normal ‘settled down’ circumstances I would be super happy, but I believe no Vermin Lord will ever fit into my back pack. Ok, it will fit, but it won’t be in one piece for long (let me just say – I’m kind of over packed, and I’m not sure how I managed to fit all those stuff in my luggage:). 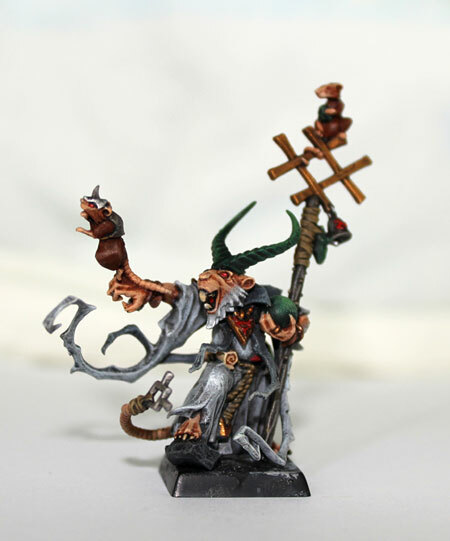 Grey Seer Thanquol and Boneripper is one of the best Skaven models I saw. I want him so bad! He need to wait for me though, until I’m back to Poland – early May. Right now I bought this Grey Seer on foot (Thanqoul was lurking at me from the shelf in miniature shop. I just sighed and whispered: next time…) and it was second best choice. The mini is superb! And the size is right – perfect to fit my plastic box I hold miniatures in. I wanted to paint him almost right away but then I said to myself: first I need to finish those neverending swarms of common rats – Slaves, Clanrats and Stormvermin. At least some of them:) At this moment, my regiment of Stormvermin is ready and I painted 3 additional Slaves, and 3 Clanrats – so with no painting remorse I could easily start Grey Seer. I painted him in many shades of grey (after all, he is Grey Seer). The horns in my opinion should be Warpstone colour – and as you probably noticed, my Warpstone green is rather different than this served us by GW. Mine is darker, more like black with green highlights. I used Caliban Green as a base. I put on it Nuln Oil to make it even more darker, and after that I highlighted it with Warpstone Glow and War Boss Green. In my opinion it gives nice glowing effect. The base looks so poor right now, but I have an idea how to change it very soon:) This will be done in Poland in May, just like explain in one of my previous posts. 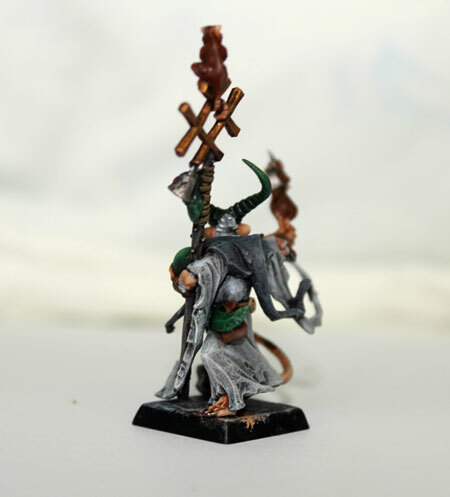 Plans for the future: paint some more Clanrats and Slaves (boring…) and then some slight change of topic. The next in Line is Blood Angels Librarian, and this I really anticipate:) . I will Stay in Huatuclo for one more week, so I ‘ll have good conditions to do so. After Huatulco, next stop – Tuxtla Gutiérrez in Chiapas State. I already have contacted with Warhammer 40k Club Chiapas, and at the beginning of April I’m going to play small battle of WH40k. Thanks to courtesy of club members, I’ll be allowed to lead one army – it’s going to be decided which one soon. I’m going to post full report with photos here for sure. Keep on trucking dude, and enjoy the sunshine! Brilliant work. Love your attention to detail. Previous PostSkaven Clanrats finally ready!